This basket was a form of frame basket made by weaving around several main hoops and added ribs. By Dawn Susan. A very unusual hen basket? 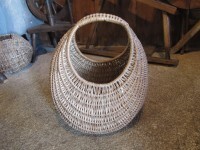 This basket is made from buff willow. Found in 1972 at the recently abandoned native summer settlement at Fearnbeg, Loch Torridon, the museum notes suggest it was probably for carrying a hen.